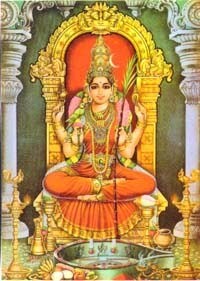 Kamakshi is an incarnation of Goddess Shakti. She is defined as the supreme goddess of beauty and the embodiment of tranquility. She is the goddess who sits on the Shri Chakra. She is also known as Lalitambika and Tripurasundari in some regions of India. She is believed to have appeared to annihilate a demon that arose from the ashes of Hindu God Kama and therefore her name is Kamakshi. She is depicted as a beautiful woman seated on a lotus dressed in red color sari and is adorned with gold jewels, gems and pearls. She has four arms. She carries a noose and goad on the top left and top right hands, a lotus and a bow of sugarcane on her left and bottom right hands. Legend has it that the Goddess appeared when Kamadeva (Hindu god of love) was burnt to ashes by Lord Shiva’s third eye. Lord Chitra karma (god of art) collected the ashes and drew a picture of a man. Shiva glanced at the ash figure and it breathed life. Chitra Karma advised the man that as he was born due to the glance of Lord Shiva’ s merciful eyes hence he should do penance to Lord Shiva and recite Shiva mantras. The man born from the ashes of Kamadev performed penance for several years. Finally, he was able to please Shiva. Lord Shiva blessed the man with the lordship of the world for sixty thousands years. Hearing this Lord Brahma feared that there would be havoc and chaos in the world and he cried out in despair ‘Bhand! hey Bhand! Therefore the man was known as Bhanda. Armed with boon of near invincibility, he defeated Lord Indra and caused great destruction on earth. Indra then performed a yajna dedicated to Goddess Shakti. From the sacrificial fire of the yajna arose the Shri Chakra and on it appeared the beautiful Goddess Kamakshi. She promised to help Indra and restore Dharma on earth. Soon she engaged Bhanda in a battle and defeated him on the fourth day. Goddess Kamakshi is mainly worshipped in South India. She is the patron deity of many families.